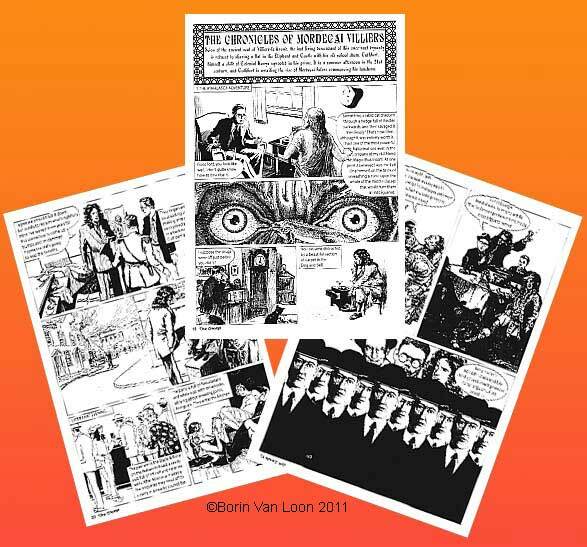 The Chap was home to Borin Van Loon's collage comic creations since Issue 7. First, the episodic adventures of Bart Dickon were laid before a discerning readership until Issue 27. From thence, Cecil de Cashmere ('The Misfortune Cookie') and Mordecai Villiers ('The Ayahuasca Adventure', 'The Luxuriant Toupée Of Sir Elton John') have been published, all in four-page installments in each issue of the magazine (originally quarterly, then bi-monthly since March, 2008). 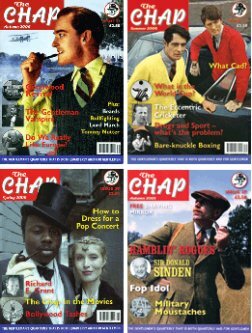 The Chap is an odd little magazine (17cm by 24cm – shouldn’t it be in some imperial size?) ostensibly published for tweedy, pipe-smoking gentlemen to read while sinking back in a leather armchair at the club, in between expeditions to the Congo or the North Pole. Its tone is very much tongue-in-cheek. Articles in the current issue (no 35, September-November 2007) range from a straightforward appreciation of the television series Adam Adamant Lives! to a faked-up set of instructions for assembling an Ikea gothic folly. Curiously, it would seem that one unexpected aspect of chappishness is an appreciation of comics. Not only does regular feature “Am I Chap or Not?” include a photograph of Alan Moore at his wedding, but the caption writer clearly assumed that The Chap’s readers would be well aware of Moore’s claim to fame, and did not need an explanation of his profession. So much for the Daily Telegraph’s “peculiarly unsung triumph”. 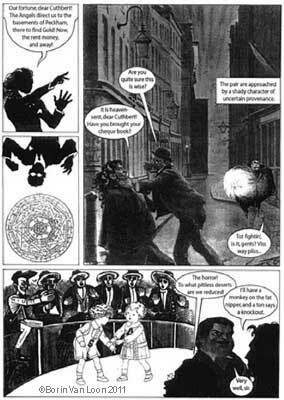 More significantly, The Chap devotes three pages each issue to a comic strip, The Chronicles of Mordecai Villiers, story by Donald Twain, art by the suspiciously named Borin Van Loon. This is produced by collage, from old book and magazine illustrations. I can’t claim that Villiers is an unalloyed success. The humour is rather forced and arch, much like the rest of the magazine, and the writing is sufficiently disjointed to compound the problems of panel-to-panel continuity inherent in the collage approach. But, still, I can’t think of anyone else currently working in the space between Max Ernst and Biff; so, if that sounds appealing, do give it a look. On the subject of Max Ernst, my belated thanks go to my friends Phil and Janie for sending me a copy of the Dover Books edition of his Une Semaine de Bonté, a story told entirely in surreal collages, which Ernst described solely as a “roman” (novel). I’m sure that Eddie Campbell would appreciate the absence of a qualifier there. I was amused to note that Ernst first published Une Semaine de Bonté as a series of five pamphlets, in 1934. Just like a real comic book! But anyone waiting for the trade would have been disappointed, as Dover’s 1976 edition claims to have been the first collection.